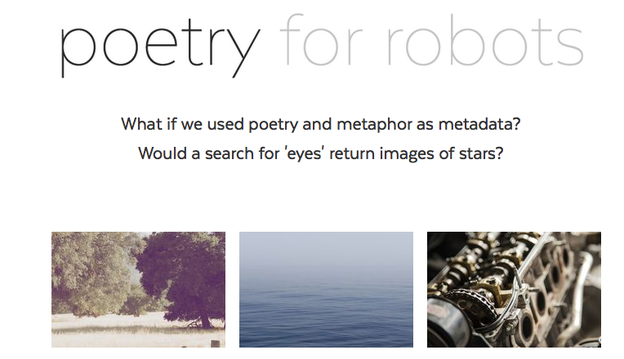 Envisioned as a digital humanities experiment, Poetry for Robots displays a set of images on its landing page. Users who click on one of these images are taken to a new page where they are informed of their participation in an experiment in metaphor and metadata and invited to contribute poetry of twenty words or 150 characters to the site, using the image as a prompt. At Webvisions Chicago 2015, the creators will analyze what the algorithms (i.e. the robots) have learned from poetry contributed to the site, using search operations. This project takes as its premise the idea that poetry and metaphor are the domains of the human. However, it raises the question of what robots might do if given poetry instead of standard metadata. For example, what kind of search results would an algorithm return if the data it has been fed is metaphorical. The implications of a project like this are the stuff of science fiction: might the robots be able to spontaneously generate poetry? Submit short poems to Poetry for Robots to find out more. Over the last 20 years or so, digital media has offered a new site for the production, dissemination, and consumption of texts. A proliferation of platforms has led to new forms through which writers share their ideas and create art. Since the earliest ventures into electronic literature, like hypertext stories shared on webpages, the development of Web 2.0 technologies and social media has turned all users into potential creators of content. Texts that emerge often blur the lines between the mundane and the extraordinary. This commentary considers the poetics of contemporary digital texts, objects, and cultures. Influenced by the questions of power, representation, and globalization central to postcolonial studies, posts consider poetics of platform, found poetry online, materiality of electronic literature, and the cultural logic of viral textuality. Roopika Risam is Assistant Professor of English and English Education at Salem State University. Her research examines the intersections of postcolonial and Africana studies, and the role of digital humanities in mediating between the two. Her monograph, Postcolonial Digital Humanities, is under contract with Northwestern University Press, and her work is forthcoming in Left History, Digital Humanities Quarterly, and First Monday.